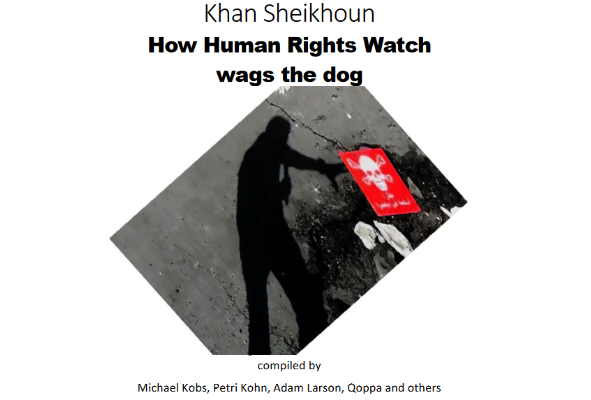 Our media source has obtained an independent investigation report prepared by the group of journalists (Michael Kobs, Petri Kohn, Adam Larson and Qoppa) “How Human Right Watch wags the dog”. The journalists questioned the credibility of the events and facts provided in the HRW report on the incident in the Syria’s Khan-Sheikhoun on April 4. The journalists’ team specializes in research and analysis on Syria, Iraq, and Libya, basing on open sources. The bloggers analyze the incidents which violate the principles of international law and result in the death of hundreds of civilians. In their reports, the activists use the same tool as Bellingcat including Google Maps, up-to-date OSINT, various graphics editors as well as 3D modeling programs. A detailed examination of Khan-Sheikhoun incident showed the conclusion of the ‘human rights’ activists’ conclusions are premature, unconvincing and extremely dangerous for foreign public opinion in the West. 1. While investigating the chemical weapon attack, HRW deliberately changed the timeline of events in Idlib province and Khan-Sheikhoun in particular (read more: ‘Construction of Motif’). 2. The ‘witnesses’ quoted in the report could not see the first bomb from the spot, where they allegedly saw it. (proved: ‘A shadow that wasn’t here’). 3. HRW claims more than 90 people were killed as a result of sarin gas usage. However, the first bomb exploded in several hundred meters away from the impact site could not have caused such lethal consequences. Moreover, no signs of blast wave or dust were spotted on the bodies of the victims. At the same time, the footages made by the White helmets activists show children who later appear in other dubious movies (proved: ‘Heroes & Victims & the Wind’). 4. The testimonies of various witnesses are controversial, and no video evidence of the airstrike exists. Besides, the team provides a version of a natural fog not caused by the bombings (read more: ‘Smoke prior to conventional bombs‘). 5. Concentrating on describing the sufferings caused by the malicious and inhumane actions, Human Rights Watch did not simulate such an explosion. For instance, smoke and toxic gas were moving strictly at an angle of 90 degrees against the wind direction while the woman and child did not only choke because of the agent drawn into the wide open doors of the house but also did not experience the impact of the blast wave though they were located 300 meters away from the explosion (read more: ‘Dust & Mist & Manipulations‘). 6. The cameramen shooting the tragedy seem to have been placed at their positions beforehand and could communicate using walkie-talkies. Moreover, they clearly knew about the approaching plane since it took from the Shayrat airbase (proved: ‘Plane Spotter & the Magical Flightpath‘). 7. The place of the explosion and crater raised many questions of the bloggers. According to them, the creator had been digger well before the incident and the fragments of the bomb were placed on it. The metal pieces of the site look like the fragments of another blast bomb without green stripes. If the shell exploded it didn’t happen on the surface as in this case the crater would have been wider (read more: ‘A KhAB filler cab & green bands‘). 8. HRW intentionally didn’t present other theories. The document was based on the version of the Syrian Air Force involvement in the chemical attack. However, initially, there were two alternative versions of the developments. The various sources named a dropped bomb on chemical weapons plant or an explosion of chemical bomb charge by terrorists on the ground as the main cause of the incident (proved: ‘Two theories & withheld factors’). Thus, the 48-sheet report of HRW is another false Western falsification based on unreliable statements and information. Such kind of operation has once again allowed accusing Bashar Assad of crimes against humanity, to show everybody the true enemy of Syrians and illegally strike Shayrat airbase. You can download the full version of the report at this link.